Looking for unique gift ideas this holiday season? Looking for ways to support local Detroit businesses, artisans, and entrepreneurs? Look no further! On Saturday, November 28, from 11am – 5pm, Grand River will be bustling with holiday fun with over 25 vendors offering shoppers a wonderful selection of unique, locally-made or locally-sourced items. The festivities take place on Grand River between Warwick and Evergreen. Co-sponsored by GRDC, Always Brewing Detroit, Pages Bookshop, and Trish’s Garage, the “Shop Small in GRANDmont Rosedale” event is part of the national American Express Small Business Saturday promotion that encourages holiday shoppers to shop at their local, independent businesses. A wide variety of products will be available to shoppers. Click here to see a list of the vendors, their products and their locations during the Shop Small event, click here. The Grandmont Rosedale Vacant Property Task Force will also be selling fresh trees and wreaths to raise money for neighborhood improvements. 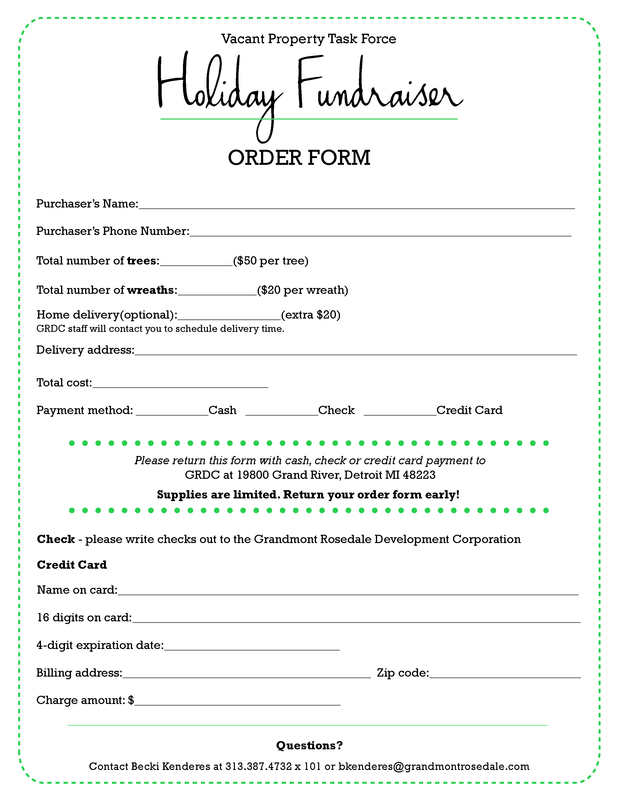 Click here to pre-order your tree and wreath. There will book signings by local authors, a scavenger hunt with the winning team receiving a gift basket filled with goodies from many of the vendors, and even free gift wrapping! A shuttle will keep shoppers moving from place to place no matter what the weather has in store. Tell your neighbors, tell your friends that this year, you’re doing all your holiday shopping in your neighborhood – this year you’re going to Shop Small in GRANDmont Rosedale!